This is primarily a place to discuss my Cleveland Browns football card collection. I will also share my thoughts on sports, and my hobbies and travels. I've been stuck trying to prepare another post, and have gone through the fun of switching my home cable and internet since my last post so I figure I'll just post the latest in this series. This post will show cards of five players with only one card in my collection, and use images from The Trading Card Database. I'm using their sorting tools to look through my collection listed on their site to see who only has one card, and then finding the first five names that I haven't posted yet. 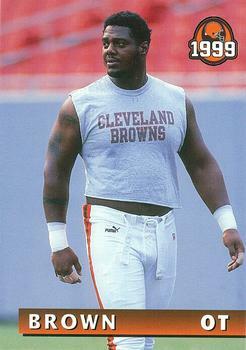 Orlando Brown was signed by the Browns as an undrafted free agent in 1993, and played in 14 games with the Browns in 1994, starting 8 of them, and then started all 16 games in 1995. Over the next three seasons with Baltimore, he started all 45 games that he played, before once again signing with the Cleveland Browns as an unrestricted free agent. I was very happy when Brown re-signed with the expansion team. It was great to see a young (28 years old), solid veteran signed to play on the offensive line. Brown then started 15 games for the team, suffering a freak injury in that final start. At the time, the NFL's referees used penalty flags weighted with ball bearings that they would throw at/near an infraction. Jeff Triplette threw such a flag that went through Orlando Brown's facemask and hit his right eye, temporarily blinding him. Orlando Brown wound up missing three football seasons before re-signing with Baltimore, where he started 35 of the 39 games that he played between 2003 - 2005. Brown died in September 2011, at the age of 40, of diabetic ketoacidosis. His son, Orlando Brown Jr., was a third round draft pick last year of the Baltimore Ravens, becoming a starter for the team in week 7. I have to say that I was kind of hoping that the Browns would draft him. 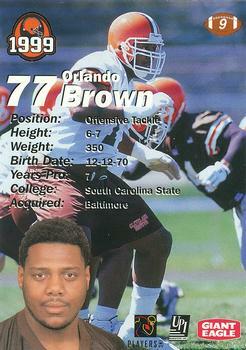 This card, along with a gold parallel, is from the only set that shows Orlando Brown as a member of the Cleveland Browns. Have I mentioned that I love team sets like this one that offer me players that would not otherwise have Browns cards? 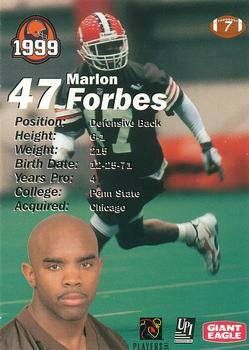 Marlon Forbes was taken by the Browns from the Chicago Bears during the expansion draft. 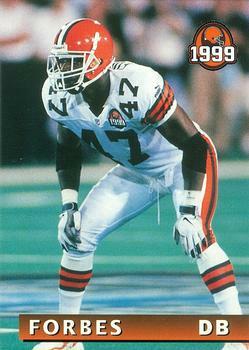 He was mostly a special teams player but did start one game at safety for the Browns during the 1999 expansion season. That was his only year with the Browns. This card, along with a gold parallel that I don't have, are the only cards that were made for Marlon Forbes' career. 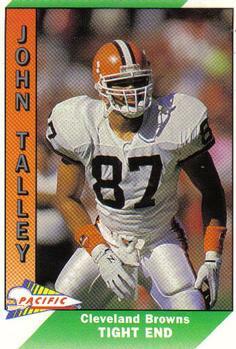 This is John Talley's only football card. His first season with the Browns is shown on the back, and he played in three games for the Browns in 1991, adding one more reception and thirteen yards to his career totals. Herman Fontenot played four seasons with the Browns, and the 1986 season shown above statistically was his best with the team. Notice the back of his card shows his receiving record, as opposed to his rushing record, which you would expect for a running back. Yardage-wise, his best season with the Browns was for 106 yards in 1986. 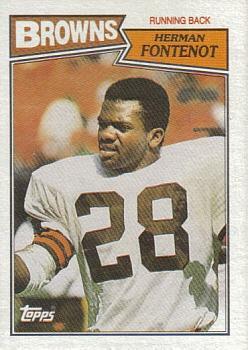 Over his four seasons with the Browns, Fontenot also returned 50 kickoffs. Herman Fontenot finished his career playing for the Green Bay Packers in 1989 and 1990. 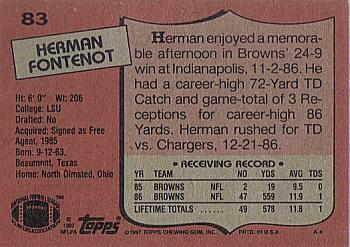 This is Herman Fontenot's only Cleveland Browns card. 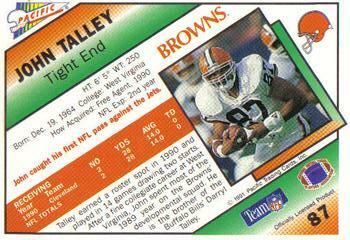 He also had cards with the Packers in 1990. This turned out to be Don Goode's sunset card. 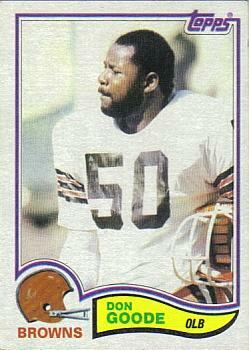 The Browns traded Goode to the Raiders in April 1982, and he was waived by the Raiders before the season began. 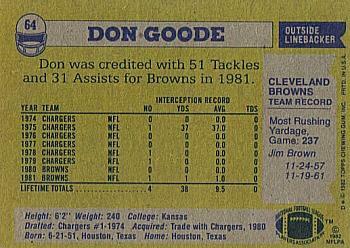 This is Goode's only Browns card, to go along with cards with the Chargers from 1977 to 1979. Fontenot played for the Packers? Had to look him up. He had decent numbers in his two seasons with the Pack, but I don't remember him.